Christmas Eve, Friday, December 24, 2010 and millions of people will watch an old movie on NBC TV at 8 PM. It’s a Wonderful Life, first shown in theaters 64 years ago, is the story of George Bailey, a man in crisis and on the verge of ending his own life. One by one, year after year, each of his own dreams had been sacrificed to make life better for other people – his family, his friends, his community, and now it seemed everything was about to be taken from him. He is rescued by Clarence, a Second Class angel who dreams of earning his wings by helping George. Clarence shows George how awful the world would have been if George had never been born, had never made those sacrifices for all those people – and how those very same people would save him if he gave them the chance. “No man is a failure who has friends,” Clarence tells George. For many years, I’ve loved the movie, but the most wonderful thing for me is that I knew the real George Bailey. This is the Jim Mutchler I knew, around the early 1960s. He was our Scoutmaster. He was the guy with the neat trucks. He was my friend Scott's Dad. And he was always smiling no matter how bad things might seem to me! The real George Bailey, for me, was Jim Mutchler of Runnemede, New Jersey. While he faced life tragedy as we all do, he never thought of suicide. Better than George Bailey, Jim found joy in the sacrifices he made for others. Jim died in the spring of this year at age 93, sadly before I could get back there to tell him how much I respected him and how much his life had meant to me. He will not be memorialized as a great man. When the newspapers and television broadcasters do their stories of the people we lost this year, Jim Mutchler will not be mentioned. And yet he was one of the finest human beings who ever lived. He was a strong and unassuming leader who had a positive impact on thousands, maybe millions, of lives. For those of us who knew him, he was among the greatest of men. 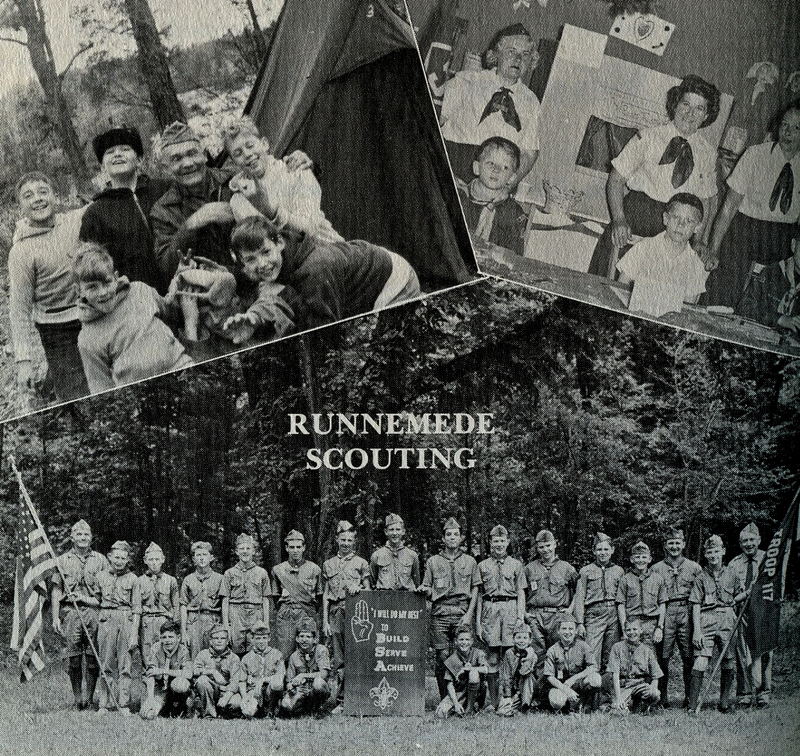 For me, as with countless other kids who grew up in Runnemede, Jim was the Scoutmaster of Boy Scout Troop 117. All that I derived from Scouting, and that’s a lot, I attribute to him. In a small town full of good fathers trying to teach their children to be good adults, he was a beacon everyone could point to and say, “Watch Mr. Mutchler, and you’ll know how a good man lives his life.” His modest obituary in The Philadelphia Inquirer headlined him as “Oil Company Owner, Volunteer.” Some of us volunteer once in a while. Jim’s life was defined by such service. Jim laid down his life for his friends, one day at a time. “Volunteer” is understatement. 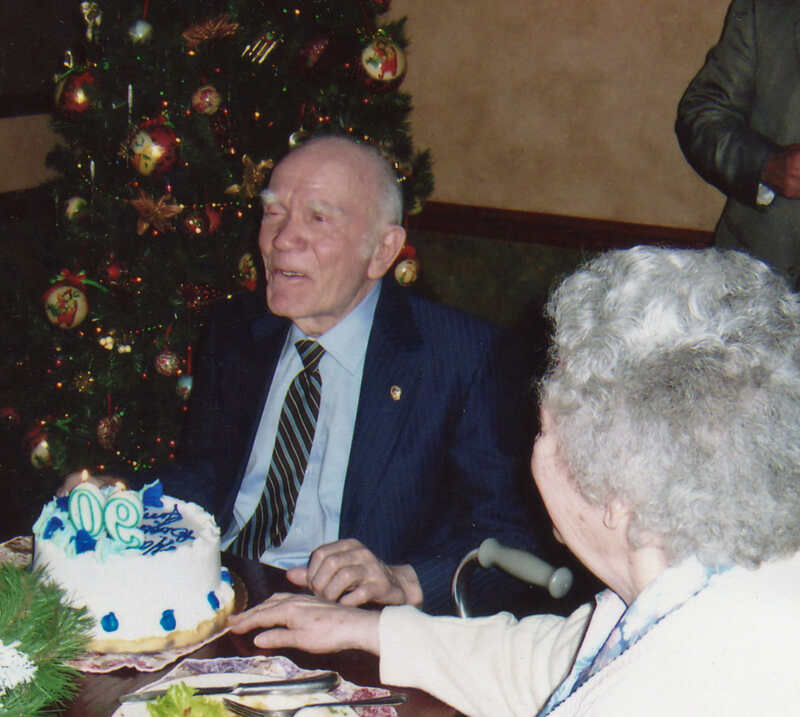 December, 1996, Jim's 90th birthday, celebrated with the Runnemede Lions. Wife Eleanor is in the foreground. 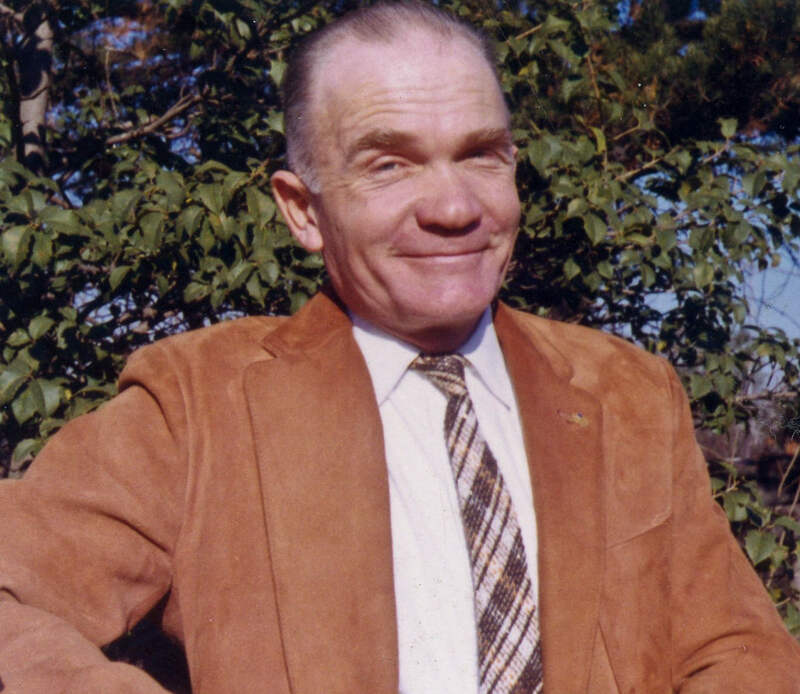 As a livelihood, Jim started and ran a little heating oil company, Timbercreek Oil Company. In the cold months, he delivered heating oil to his customers and kept their heaters working. In the warm months, he did maintenance and repairs and whatever else to keep life and limb together. I know at least one summer he tried life as a carny. He put together a couple of carnival attractions and toured the local carnival circuit. But his real love was Scouting and the local Lions club and just being available as a friend, and worker, whenever he was needed. Frank Thatcher, an attorney in Runnemede since 1959, knew and worked with Jim in the Lions for over 40 years. He said: “Jim lived his life giving to others. Jim operated Timbercreek Oil Company and I know personally that if someone needed oil and had no money he would deliver.” This point about accommodating people who had no money was made by others in the town who knew him well. Like George Bailey in the movie, it looks like Jim was a mystery to his more profit-oriented business competitors. “Mr. Mutchler was my scout master 40 years ago and I had the utmost respect for him and still do to this day. He had a genuine warmth and strong moral character. He taught us all what was expected from a scout. In addition to the skills of knot tying and pitching a tent, he taught us respect – for the Earth, God and each other. I remember being on a trail and stopping to listen to birds with him. I remember comfort as an 11-year-old boy (with tears) carrying a backpack in the rain and that everything would be all right. I remember reverence for God on a Sunday morning, around the campfire after breakfast, Mr. Mutchler saying spiritual words. “I want to share a story. I was a 17-year-old with low self-esteem and not thinking I was smart enough to go to college. It was my belief that the best thing for me to do was join the Marines after high school. Obviously my mother did not like that idea – but who listens to mothers? I saw Mr. Mutchler at a July 4th event at the ball field and he asked how I was doing and what I was planning after high school. I expressed my interest in joining the Marines. He shook his head and thought I would be better off going to college and was sure that I was smart enough. We had a nice talk and I decided to follow his advice and go to college. I studied Criminal Justice and became a New Jersey State Trooper, retiring with 25-years service in 2004. A young Jim Mutchler, outdoors, of course. Where does a man such as Jim Mutchler come from? While Jim’s life was interesting, I don’t see anything extraordinary in what I’ve learned of it. Family, I suspect, had more to do with it than anything. Jim’s grandfather, Thomas T. Mutchler, was a respected physician and minister in Philadelphia in the late 19th and early 20th Centuries. After a big-city upbringing with his strict pastor father, Jim’s father seemed to crave the great outdoors and headed west in search of adventure. His work in the Montana copper mines wasn’t his idea of outdoor adventure so he started hiring out as a guide in the newly created Glacier National Park. He met another easterner out there, a nurse, and married her. So, on a cold, December day in 1916 Jim Mutchler was born in Montana. Three years later, his family came back east for a visit, and stayed. They wrote to their neighbors out west to sell off their property and possessions, and that closed the Montana chapter. This son of the west was raised amid the farmland and woods of south Jersey. After graduating from high school, he worked his way up to Shipfitter, First Class at the New York Shipbuilding Company in Camden, NJ. He spent the Second World War years building U.S Navy vessels like the battleship USS South Dakota. He was also a member of the U.S. Navy Reserve. During those war years, Jim self-published a newsletter he called the Hometowner, and he mailed it to local servicemen away from home so they could keep up with hometown happenings. In 1945, Jim took the plunge in real small town style. He married his sister’s friend, Eleanor Price. They were married for 65 years, until Jim’s death. The marriage produced two wonderful sons, Scott and John as well as a family that became an engine of social service in the little Borough of Runnemede. Troop 117, Boy Scouts of America, somewhere around 1960. Scoutmaster Jim Mutchler is first on the left. Fourth on the left is Jim's son, Scott. I'm the jaunty looking lad, fifth in from the right. Photo courtesy of William Leap and Borough of Runnemede, from Mr. Leap's book, "The History of Runnemede New Jersey 1626 -- 1976. Jim was relentless about his community service. Bill Leap, a Runnemede businessman who wrote the book, The History of Runnemede New Jersey 1626 – 1976, tells a typical story. Runnemede had an annual blood drive, and there was a quota from the county chapter. A woman in town who was a nurse had been organizing and administering the drive each year. She told Bill Leap she wasn’t going to be able to continue and asked if he could find someone else to handle the responsibility. Leap mentioned this to Jim Mutchler one day in passing. From that point on Jim was running the blood drive – and he did it so well the county stopped giving a quota to Runnemede because it would always be exceeded with Jim Mutchler at the helm. Leap said he thought so much of Jim and his contributions to the community he encouraged the Borough of Runnemede to have an official Jim Mutchler Appreciation Day. He said they did this on January 1, 1996 and honored him with a dinner, speakers, recognition plaque, etc. “He was some kind of man. He was terrific. We need more men like him,” said Leap. 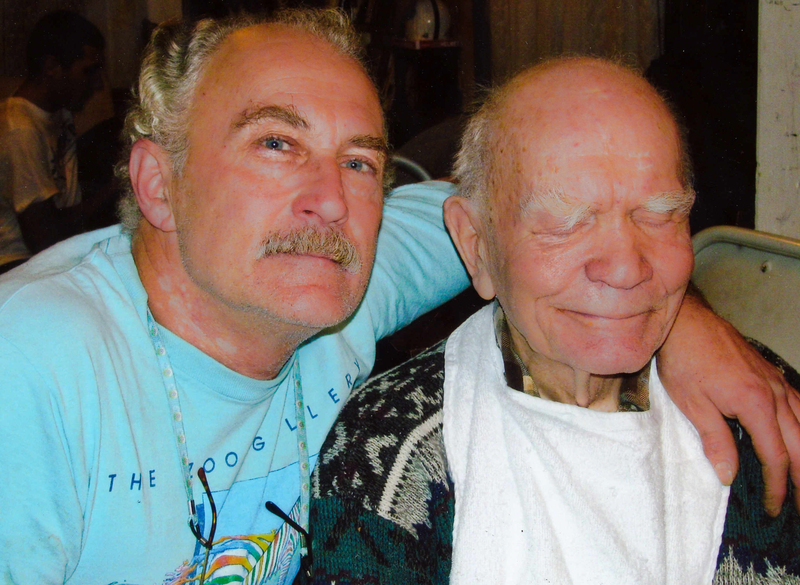 My friend Scott Mutchler with his Dad last December at his last birthday, age 93. Jim was blind by this time, but he's still smiling. Life today is lived at a very high speed. Few of us can slow it down long enough to discern the people around us who are really making a difference in the lives of other people. I was over 60 before I slowed down long enough to appreciate the stunning impact of Jim Mutchler’s life. I did not get the chance to tell him in person as I had intended. So, I’m telling the world. 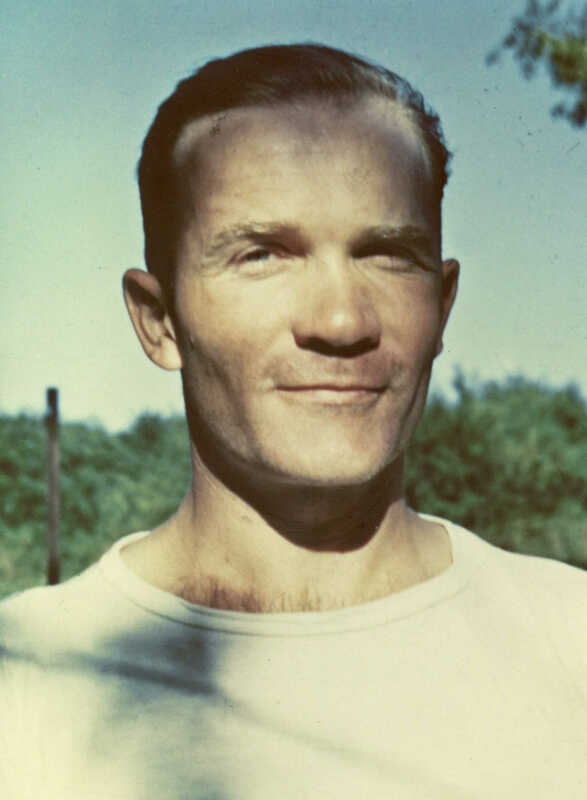 David Henry Thoreau said, “The mass of men lead lives of quiet desperation.” Jim Mutchler’s life was one of quiet inspiration. And humble dignity. And compassion. And the fullness of what it means to be a good human being. If you’re lucky enough to have a Jim Mutchler in your life, please tell them how much you respect and appreciate them. If you don’t say it, they don’t hear it – and they do deserve to hear it. I don’t know if there is a heaven, or if there are angels. If such things do exist, I’m sure Jim Mutchler is there, and I know he’s already quietly establishing a new standard for what it means to be a good angel. Take good care of him Clarence, for he has many friends! 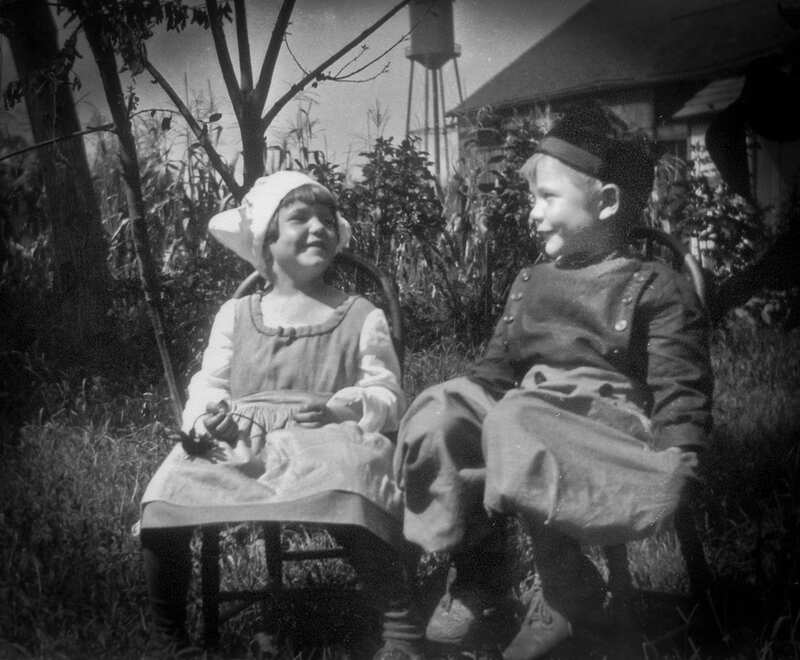 Jim Mutchler, probably around 1921. The girl may be his sister Emma. What a fine article about a fine person! He was my uncle and everything you said and more. His family knew him to be just whom you said, as close as it gets to George Bailey. Just knowing he was there, made our world a better place. He and his wife have been our measure of kindness, Christianity, disposition, Charity, and just plainly like you said what it is to be a good man and husband to a good woman . When he met a situation he used his best judgement, and sense of what was right and fair and what could come out of it to change for the better all who were concerned. You always learned how to make the best choice and felt fed for a long time spiritually and emotionally and you were left with much food for though tafter a converstion with him . He was open to change in this world , without forgetting where the timeless heart with christian values belonged. And although I could never live up to what he lived I never felt judged. He just quietly reminded us all of how things were for him and he made it possible for us to remember how they could be for us. His family honored him. His wife was his true help mate. There was nothing his family didnt do for each other, and in this day of phone calls and e mails they still stay close to each other, in the midst of so much change. I have never met anyone like him, but hope there are more like him, because if we cant find men who embody what you so eloquently described of him and his life, we have forgotten ourselves. And that is scarey. If anyone still lives in Runnemede New Jersey reading this. There is a park that Uncle Jim is responsible for creating in Runnemede You can walk to from his house, and he had a dear friend that walked with him often on the mile long paved path in the park for years after he became blind. He continued to help with the rummage sales for the church long after he couldnt see. He wrote us letters, blind, after his wife folded the paper so he could feel the lines , and she corrected a few words, but his pen man ship was mainly legible,and he coherent , even years after not being able to see anything. His wife had a place for everything and everything went in its place, so he could continue to live at home, with her incredible companionship, when most people would have been sent to nursing home for care. He was an avid phillies fan, and after he couldnt see, she watched the game in the lr and he listened to the radio. Then they would talk about it.He often called in to the station, and the announcers knew his voice and called him by his first name. Everywhere he was , he kept the ideals going, even in the baseball world. He loved us all. And we loved him. He lived a better than good life. This is a beautiful tribute to my great uncle Jim. I would also add that he was a leader in our very large family. Often, heading up camping family reunions with fantastic adventures. I have so many beautiful memories of him! Great tribute. The only way I knew Mr. Mutchler was that (1) he was Scott’s dad, and (2) he delivered our heating oil. Thanks for the memories.